Industrial Catalytic Processes for Fine and Specialty Chemicals provides a comprehensive methodology and state-of-the art toolbox for industrial catalysis. 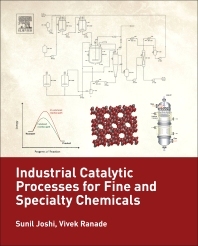 The book begins by introducing the reader to the interesting, challenging, and important field of catalysis and catalytic processes. The fundamentals of catalysis and catalytic processes are fully covered before delving into the important industrial applications of catalysis and catalytic processes, with an emphasis on green and sustainable technologies. Several case studies illustrate new and sustainable ways of designing catalysts and catalytic processes. The intended audience of the book includes researchers in academia and industry, as well as chemical engineers, process development chemists, and technologists working in chemical industries and industrial research laboratories. Sunil S. Joshi is well experienced in the field of chemical engineering, catalysis and catalytic processes. His career as the Senior Principal Scientist for the Chemical Engineering & ProcessDevelopment Division at CSIR-National Chemical Laboratory, Dr. Joshi has years of experience in research and development and has translated his research into practice. Dr Vivek V Ranade is a Deputy Director of CSIR - National Chemical Laboratory (www.ncl-india.org) and Chairman of Chemical Engineering and Process Development Division. He has contributed significantly to chemical engineering science and practice. His work has resulted in new insights and better designs of industrial flow processes. He has successfully developed solutions and has facilitated their implementation in a wide range of industry. He has also developed various devices (micro-reactors, filters, vortex diodes) and products. He is currently leading a large program on process intensification entitled Indus MAGIC (www.indusmagic.org) which is aimed at developing MAGIC (modular, agile, intensified and continuous) processes and plants. He has established first of its kind industry consortium on process intensification (Indus CPI) at NCL. He is actively working with a wide range of fine and specialty chemicals industries to transform the way we manufacture these chemicals. Dr Ranade is a Professor at Academy of Scientific and Innovative Research (www.acsir.res.in) and an Adjunct Professor at ICT (formerly UDCT: http://www.ictmumbai.edu.in). He also worked at ETH, Zurich; TU Delft and University of Twente, The Netherlands as guest researcher. He has published more than 125 papers and five books. He is co-inventor of more than 20 patents (granted or filed). He is an Associate Editor of ‘Industrial & Engineering Chemistry Research’ and serves on editorial boards of ‘Chemical Engineering Research & Design’ and ‘Indian Chemical Engineer’ journals. He is a recipient of several awards including Shanti Swarup Bhatnagar award and DST Swarna Jayanti Fellowship. He is a fellow of Indian National Academy Sciences, Indian National Academy of Engineering and Indian Academy of Sciences. He is also an entrepreneur and has co-founded technology based start-up companies: Tridiagonal Solutions (www.tridiagonal.com); Vivira Process Technologies Pvt. Ltd. (www.vivira.in). Dr Ranade previously authored Trickle Bed Reactor (9780444527387) and Computational Flow Modeling for Chemical Reactor Engineering (9780125769600) with Elsevier.